This past weekend was no exception. With the last and final installment of the Harry Potter series, the much anticipated “Harry Potter and the Deathly Hallows – Part 2” made $168.6 million this opening weekend! According to CNN, this eighth Harry Potter film was the best opening weekend film to date and also scored the largest midnight debut. You can find a lot of cool Harry Potter items and collectibles on Listia. Didn’t get a chance to see the first 6 movies? Check out this awesome Harry Potter dvd box set. With summer halfway through, I’m excited to see what other movies are in store, like “Captain America: The First Avenger” out this Friday, July 22. First up is the process a user will go through when they win an auction. The first thing you’ll see when you win an auction is the shipping address selection form. Select a saved address, “none” if no shipping address is need or you can add an address by clicking the link. If the auction requires payment for shipping this information will still be delivered via email/message. Once you’ve sent your address and payment (if applicable) the seller should be on their way to send out your item(s). If you get the item be sure to notify the seller by clicking the “Got It!” button. If you don’t get your item and a refund is available, there will be a link at the bottom right to initiate a refund request (see next screenshot). After you get your item, leave feedback for the seller! The link to request a refund will be at the bottom right corner. Now, on to what the process will look like for a seller. After your auction has ended if you don’t receive shipping information from the winner you should email them to remind them to send that information to you. Be sure not to use any addresses sent to you via email or message as this will be taken into consideration if there is a dispute. Users are required to use the shipping address form. After you get the winner’s shipping information you can send out their item(s) and leave feedback! If there is a dispute on your auction this will also look a little different than what you may be used to. If you win an auction and file a refund request you can now cancel this before the seller replies (previously not allowed). The seller will be notified via email if you cancel your request. We hope you enjoy the new changes and we’ll have a way for you to leave feedback and report any bugs that you see! Overall we’re hoping that this is an improvement from what we have today, thanks for reading! We’re happy to announce our newest team member, Shane! He is the latest addition to our engineering team and will be helping us roll out exciting features and improvements to our site. 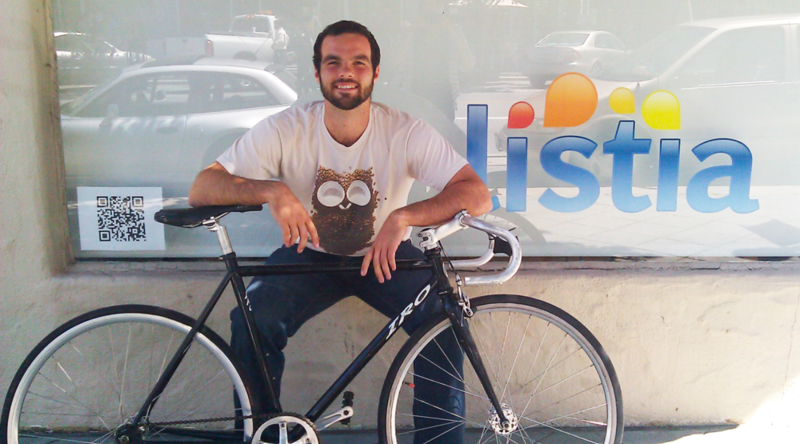 Leave a comment for Shane and welcome him to the Listia community! Summer always reminds me of having fun and being out and about. The three day holiday break last week encouraged me to make this summer season memorable and adventurous (while watching my wallet). That’s why I came up with some cool goals to hit this summer: To explore inexpensive local activities. Most cities regularly hold a weekend farmer’s market, so if you’ve never explored one before, it’s worth checking out. Not only does it bring a community of people together, but farmer’s markets host local vendors with fresh seasonal produce that can be more affordable than your average supermarket. I’ve been to a fair share of farmer’s markets in the past, so I always know to bring my reusable bag and cash with me. With the rise of gas prices in recent months, the amount of bike ridership has increased. Not only is it a cost effective mode of transportation, but it’s also a healthier alternative and reduces your carbon footprint. My goal this summer is to bike to work, which is roughly 3 miles one way. Whether you want to bike for pleasure or for purpose, change your pace and give bicycling a try. It’ll definitely be a rewarding workout. Visiting the library and joining the summer book club used to be an annual ritual when I was a kid. Nowadays, we have eBook readers, tablet devices, and other technology products that take us away from the physical copy of a book. Going to the library not only lets you explore and browse, but it’s also a rewarding experience of borrowing and reusing an item. Whether you live in a rural neighborhood or in a big metropolitan city, it’s always nice to step away from the familiar and go somewhere fun. I live close enough to lots of entertainment spots and dining, but far away enough from the big city life. Exploring what’s around you allows you to experience the city in ways you may not have before. What goals would you like to reach this summer? Leave a comment and share with us your plans. Also if you’re a regular biker, what tips would you suggest for someone who hasn’t ridden in a while? Any tips would be helpful. Starting July 11, we will be enforcing a few new rules regarding shipping timeframes. These rules are meant to improve communication between sellers and winners after an auction ends. As always, we know most of you will send shipping info and ship items well before these deadlines, but they are here to help us in case of disputes. More info will be posted on the site once the rules are in place. Starting July 11, the following set of rules will limit the maximum amount of time given for communication and shipping after a listing ends. We do encourage everyone to communicate much faster than this to ensure a great experience for everyone involved, but here are the maximum timeframes.